Northeast Rockbuster members equipment working at our show in Concord NH in August 2018. 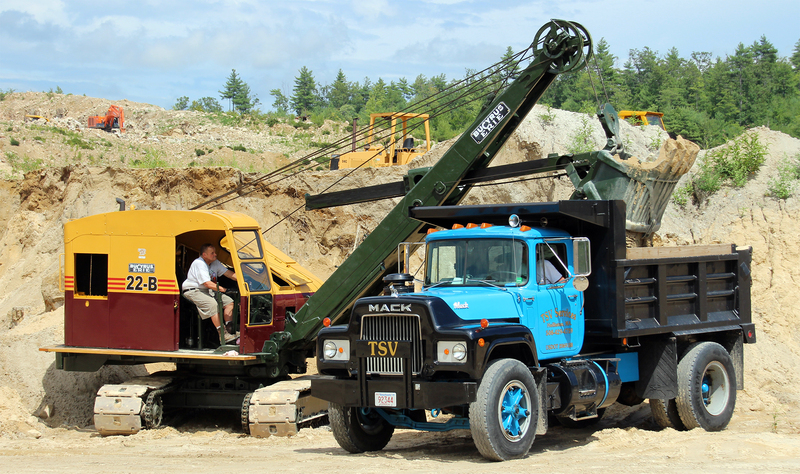 Make sure to mark your calendar for our 2019 show At Concord Sand and Gravel, Concord NH, August 2nd, 3rd and 4th, 2019. We are the Northeast Rockbusters, the New England Chapter of the Historical Construction Equipment Association (HCEA) which is headquartered in Bowling Green Ohio. We would like to welcome you to our organization and let you know what's in store for you if you become a member of our organization. First - there is no requirement to own or operate equipment to be a member. All you need is just to be interested. As a member you will receive, "Rockbuster News", our chapter newsletter. The newsletter announces upcoming meetings, includes articles of historical interest, and stories from our most recent adventures. We also publish classified ads free for our members. We have an annual schedule of events listing; this includes not only antique equipment shows, but tractor and truck shows as well. This list is the most complete you will find. It alone is worth the price of membership. We meet at least six times a year, usually at a member's home or shop. By moving around we can see what our fellow members have for "toys", as well as their everyday equipment. Meetings are usually held on a Sunday with a "show and tell" session. Members bring photo albums, old literature, stories, etc., all being items of interest. Technical problems and questions, about where to find obsolete machines or parts have been answered at our meetings. The best part is the people you meet, and getting the "free history lessons". Northeast Rockbuster's dues are $20.00 per calendar year. In order to be a member of a chapter, you are required to be a member of the National Organization, (HCEA); dues for HCEA are $35.00 per calendar year and can be paid with your Northeast Rockbuster Chapter dues.